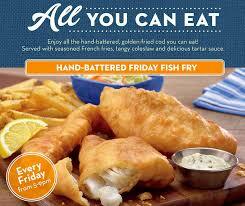 Village Inn has All You Can Eat Fish Fry Every Friday from 5-9pm! Hand-battered, golden-fried white fish, served with seasoned French fries, fresh coleslaw and tartar sauce. All You Can Eat Friday Fish Fry is available only at participating locations.